Sen. Bernie Sanders hinted that he may soon officially drop out of the Democratic presidential primary. 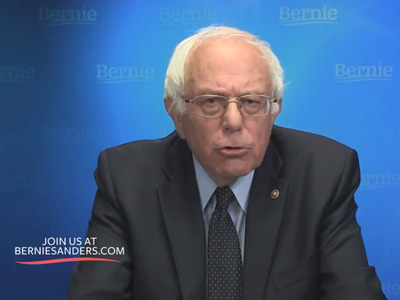 In a video address to supporters on Thursday, Sanders said that he is prepared to help defeat presumptive Republican presidential nominee Donald Trump. But the Vermont senator also indicated that he may not drop out before the convention, despite lacking the delegates needed to secure the nomination. “Defeating Donald Trump cannot be our only goal. We must continue our grassroots efforts to create the America that we know we can become,” Sanders said, according to prepared remarks. Sanders’ campaign has been more or less on ice since presumptive Democratic presidential nominee Hillary Clinton’s decisive victory in the California primary last week. Sanders laid off at least half of his staff last week, and largely avoided public appearances and speeches. On Tuesday, Sanders met with Clinton for what some observers described as a productive, but occasionally tense meeting where the two discussed the terms of Sanders’ exit and how best to beat presumptive Republican presidential nominee Donald Trump. The New York Times reported that the Vermont senator declined an opportunity to endorse Clinton in order to seek further concessions on many of the policies he championed in the campaign. Sanders said in his address that he anticipated future discussions with Clinton’s campaign. “I look forward, in the coming weeks, to continued discussions between the two campaigns to make certain that your voices are heard and that the Democratic Party passes the most progressive platform in its history and that Democrats actually fight for that agenda,” Sanders said.